460 Commercial Real Estate and Properties in Sydney Southern Suburbs are listed in 8 categories. We have 187 Offices for Sale & Lease , 125 Industrial Warehouses for Sale & Lease , 109 Retail Shops for Sale & Lease , 19 Development Lands for Sale & Lease , 11 Showrooms for Sale & Lease and 10 Other Commercial Properties for Sale & Lease . Gunning Real Estate is pleased to present this freestanding retail building for lease. The property is centrally located just 80m from Kogarah train station and the shopping centre, 120m from the St George Bank headquarter, 450m fro mSt George Public Hospital, and 500m from St George Private Hospital. The property features a spacious open plan shopfront plus 1 toilet and 1 storage room at rear. KEY FEATURES: Internal area: 150sqm Two (2) allocated car spaces Loading dock at rear Air conditioned Own toilet 3 phase power (300amps) Motorised roller shutter at shopfront Excellent natural light & airflow Suits many uses Please contact William Wu (0450 250 123) for details or inspection. All figures above are approximate. 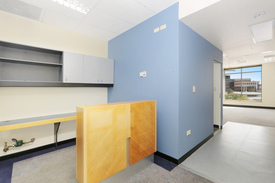 Great opportunity to lease modern partitioned office / consulting rooms located directly opposite Rockdale Plaza Key features include: Currently DA approved for "Physiotherapy Centre" 142m2 Currently occupied by "Sydney Physio and Pilates" Front reception area plus seated waiting area Five (5) consulting rooms / offices + open plan area or exercise area Ducted air conditioning throughout Internal kitchen / storage area Internal amenities Ample natural light throughout Some external signage available Two (2) secure car spaces Conveniently located directly opposite Rockdale Plaza Short stroll to Rockdale Shopping Centre and Rockdale Station Suite variety of uses including Medical, Physio, Professional uses, legal, accountant etc. (Subject to Council Approval) Call to arrange an inspection today! Located in Revesby & in excellent position with exposure, this flexible professional space is very well presented, modern with ample nature light. This property would suit many uses such as professional office, consultation rooms for medical & allied health, beauty rooms & much more. Property/location features: Approx 83 m2 commercial / retail space Main Road Exposure Partitioned offices; air conditioning, kitchen & bathroom facilities Larges amounts business exposure Local bus services at your door step Modern fit out On street parking Contact exclusive agent Aaron Brooker on 0404 888 060 to discuss lease options & to organise an inspection. This 220sqm approx space is well located with plenty of passing traffic, and is a great location for a shop, showroom, office or warehouse! Enjoying great exposure on the Kingsway, Caringbah Close to Caringbah Train Station Council carpark at rear 220m² approx. open plan shop space Good natural light internal amenities Flexible lease term available from short term to 3x3 years 3 months rent free incentive available for long term tenancies. We own a block of 6 two bedroom units which we would like to sell off market. Currently the building is a 2 storey walk up built in the early 70's. Three by 2 bedroom units per floor. 3 LUG + open parking. We have upgraded all units with new kitchens, appliances, internal laundry, carpet/timber floating floors, wardrobes, paint, light fittings, blinds, new garage doors, paint external brickwork etc.. Units are currently rented between $420 $460 per week. UNIT 6 is currently on the rental market @ $450 per week. Property is over 800sqm with R3 Zoning, FSR 1:1 height limit 12m. Would suit a Boarding House, Child Care or Long Term Hold. Return is approx. $140,000 PA Gross. Located directly opposite the Revesby Train Station & walking distance from cafes, shops, restaurants & more, this office suite is available from April 2019 at an affordable rate. The property details are below: Approx 11 m2 On site amenities Complex signage (internal & external) Intercom Separate phone line Separate data points Separate electricity meter Air conditioning Neighbours include solicitor, home builder office, beauty consultants & other professionals. Contact exclusive agent Aaron Brooker on 0404 888 060 to discuss the lease options today. Gunning Real Estate is pleased to present this modern shop/office for lease. Located just off Princes Highway and directly adjacent to the entrance/exit of Rockdale Train Station, this great spot is sure to capture plenty of foot traffic. The property features a reception area, an open plan light filled space, and a partitioned office. Common toilets are available. KEY FEATURES Internal area: 45 sqm (approx) Grease trap & gas in building Can be easily converted to one open plan shopfront Extensive glass frontage Excellent signage exposure High volume foot traffic Filled with natural light Common toilets Air conditioned Existing real estate office fit out Suits many uses Please contact William Wu (0450 250 123) for details or inspection. All figures above are approximate. Gunning Real Estate is pleased to present this first floor office for lease. Located on the busy Princes Hwy, the property is located only 250m from Rockdale train station and 100m from public car park. It is also surrounded by blue chip tenants including H&R Block, St George Bank, and Commonwealth Bank. The property features a spacious open plan area and 3 partitioned rooms. Own male & female toilets and kitchenette are available. KEY FEATURES: Internal area: 94sqm Ducted AC Own M&F toilets + kitchenette Excellent main road signage opportunity Existing office fitout All day car park nearby Suits many uses Please contact William Wu (0450 250 123) for further information or inspection. All figures above are approximate. Gunning Real Estate is pleased to present for lease this recently built warehouse located just off West Botany St and within close proximity to Princes Highway, M5, and Port Botany. The property features a high clearance warehouse area and a modern mezzanine office. KEY FEATURES: 430sqm warehouse + 45 sqm office Four (4) allocated car spaces right in front High internal clearance (8m 9m) Male and Female toilets + kitchenette Air conditioned office with district view 3 phase power Building security system Suitable for a variety of business usage Please contact William Wu (0450 250 123) or William Gunning (0413 610 194) for details and inspection. All figures stated above are approximate. Gunning Real Estate is pleased to present for sale via Expressions of Interest, this prime mixed use development site opportunity in an excellent position & location. Situated directly across from Kogarah Station & Kogarah Town Centre shopping mall, the site is also within close proximity to both St George Private & Public Hospitals. The site itself currently has six individual shops facing onto Station Street & features a steep slope to the rear of the block, potentially reducing significant construction costs. KEY FEATURES Land Area: 1,268sqm B4 mixed use zoning Flexible terms available Approximately All Expressions of Interests are to be submitted by Thursday 23rd May 2019 at 3pm (AEST). For more information please contact the agents. Motivated Landlord! Motivated Landlord - Avai..
Set in a prominent position within the Revesby central business district, this retail/office space is very well positioned with excellent signage potential given the fact that it is dual street facing. Property features include: Engaging position Outdoor area included On site parking plus customer parking Rear lane access Private amenities Signage potential front, side & back. Surrounded by well established businesses & the general public Minutes to Revesby train station & local bus services To discuss the leasing opportunity & to arrange an inspection, contact exclusive agent Aaron Brooker on 0404 888 060 today. 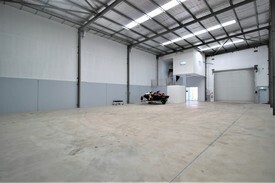 Gunning Real Estate is pleased to present this high clearance warehouse with a large mezzanine office component. On the ground level, the unit is fully self contained with male, female, shower and kitchenette facilities. The mezzanine level is fully carpeted and air conditioned and comes complete with 5 partitioned offices, store area and board room. Located within close proximity to Arncliffe railway station and shops, the property is a short drive to Forest Road and Princes Highway with M5 on and off ramps close by. The property is also only minutes away from Sydney International and Domestic airport and Port Botany. Available to move in from 1 July 2019. KEY FEATURES Ground level: 220sqm First floor: 110sqm Total building area: 330sqm 3 allocated car spaces On site Cafe Container height roller door 6 7 m internal height Three phase power Electric roller door Approximately Please contact William Wu (0450 250 123) and James McKenny (0423 048 814) for further info or inspection. Gunning Real Estate is pleased to present this newly renovated 2 level retail/office premises for lease. Located on the local retail strip, the property is only 50m from Carlton train station. Ground floor of the property features an open plan shopfront, with toilet + storage + kitchenette at the back . 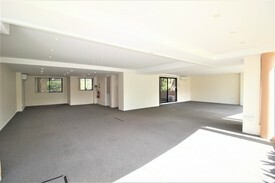 1st floor features an open plan office/storage area with 1 windowed partitioned room. KEY FEATURES: Internal area: 120sqm (60sqm on each level) Toilet & kitchenette Air conditiong Just renovated Close to train station Great natural light Abundant off street parking Please contact William Wu (0450 250 123) for further info or inspection. All figures above are approximate. Located with Panania, this retail / bulky goods type property presents a big opportunity to anyone who needs a larger than most sized property which is still at a very affordable rate. Property features include: 5 car spaces High clearance Air conditioned On site amenities Container access for deliveries Main road exposure Available now To discuss the leasing opportunity & to arrange an inspection, contact Aaron Brooker on 0404 888 060 today. Please note that all areas quoted in this advert are an approximate size only. Unique opportunity to lease a 2 level freestanding office building with 20 on site car spaces Key Features include: Ground floor offices approximately 600sqm comprising front reception with waiting area, several separate offices, huge boardroom, two (2) spacious halls / offices Generous kitchen opening onto huge staff room / lunchroom First floor storage / work area 500sqm Ample separate male / female amenities plus showers Several generous sized storage / file rooms Air condoned throughout Great outdoor area / garden area for staff and clients Ample on site parking for 20 cars Suitable for general offices, child care, medical, education use etc. (Subject To Council Approval) Conveniently located 1.5 km to Bexley North Railway and easy access to Rockdale, Kogarah and Hurstville Shopping Centres Owner offering very realistic rental Great leasing opportunity not to be missed! Gunning Real Estate is pleased to present this ground floor retail shop that is ideal for food related tenants. The property is centrally located just 270m from Kogarah train station and shopping centre, 220m from St George Public Hospital, and 450m from St George Private Hospital. The property features a spacious open plan shopfront, plus a disabled toilet, a wash up area, and a storage area at the back. Rear lane access and own parking are also available. At the back of the building is a newly renovated 2 bedroom residential unit with its own kitchen and shower. OPTION to lease the shop by itself, OR lease both the shop and the residence at a discounted rate. KEY FEATURES: Internal area: 85sqm (shop) + 51sqm (residence) Option to lease the shop only OR lease both shop & residence Two (2) allocated car spaces Rear lane access Grease trap + exhaust duct + gas in place Previous tenant: The restaurant 'Papparoti' Own toilets & shower Main road signage exposure Suits many businesses Please contact William Wu (0450 250 123) for further info or inspection. Gunning Real Estate can provide prospective tenants with initial advice regarding DA/CDC approvals & Construction based on our 20 years experience in retail leasing. All figures above are approximate. 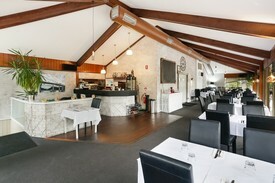 Gunning Real Estate is pleased to present this boutique restaurant for lease. Set along the foreshore of the Woronora River, the property offers sweeping district and water view. The property features an elegant open plan dining area, a fully fitted commercial kitchen with cool room, and its own male&female toilets. KEY FEATURES: Internal area: 191sqm Two (2) allocated car spaces All day car park just downstairs Fully fitted kitchen with cool room Additional storage area Grease trap, exhaust & gas in place Air conditioned Excellent view & natural light Suits many uses Please contact William Wu (0450 250 123) or William Gunning (0413 610 194) for further info or inspection. All figures above are approximate.